Victory Custom Athletics is a Chatsworth, California sporting goods company founded in 1988 with the intention of creating baseball uniforms with extra attention to pattern and design. Operating under the policy that a uniform should perform as well as the athlete, Victory has always emphasized durability, comfort and functional fit in their products. Knowing that the sports uniform business has always been a crowded, Victory has tried to distinguish themselves by focusing on laser-sharp customer service from day one. They also use only the best natural and synthetic materials in their uniform, operating under the mantra a chain is only as strong as its weakest link. Victory baseball uniform feature elastic, snaps, buttons, and zippers which far exceed the industry norm. Bar tacked reinforced belt loops, cover stitch and double standard come standard on Victory products. 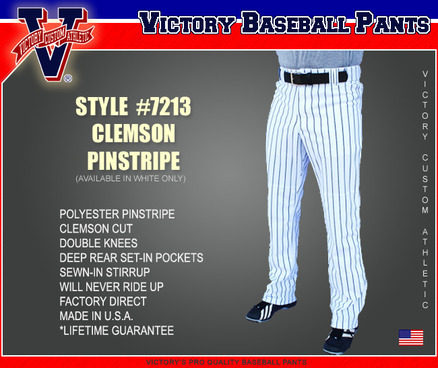 Victory baseball pants are made in the USA, just like America’s pastime, and because they are factory direct so there is no dealing with a middleman and you will always know where your order stands. Victory baseball pants come with pro tunnel belt loops, heavy duty brass zippers, reinforced twill tape in the crotch area, cover stitched seams, non roll elastic waistband, nickel plated, reinforced double knees and a lifetime guarantee. Yup, that’s Big League quality. 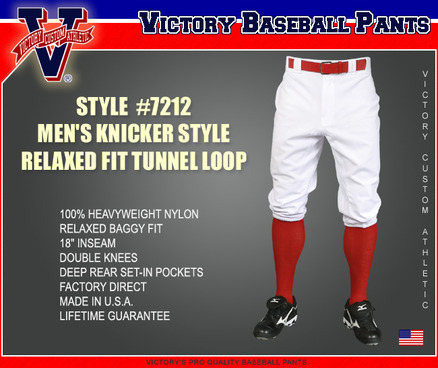 Victory baseball offers six styles of pants. Clemson cut, old school, low rise, Manny, traditional tapered and vintage. Clemson cut is more or less their standard pant. It features a leg that runs down to right above the shoe and a hidden stirrup. A pair of Clemson cuts will run 79.99 dollars for white or grey and $81.99 for pinstripe. Old School features the classic knicker style, with the pant baggy and ending right below the knees. It runs $67.99 and Victory will also sell you the stirrup and sanitary required to pull of the look for about twenty bucks. Low rise is basically just the Clemson cut with a low rise waist and it costs $79.99. Manny cut, which seems to make reference to the haphazard uniform of former slugger Manny Ramirez, is looser and more flexible above the knees and also runs $79.99. Traditional tapered gives you a sleek tapered look and elastic ankle openings for $73.99. Vintage is similar to old school, but with a tighter fit on the things. It goes for $67.99. 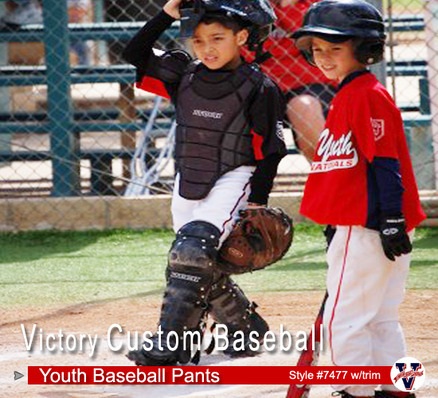 Additionally, Victory has youth baseball pants in all of these styles and colors. Youth pants cost between fifteen and twenty dollars less than their adult counterparts. Victory also offers player packs which are by for the most economical way to buy Victory uniforms. All the packs, which are meant to be bought in bulk for a baseball team, are a bit different. They generally include four or five tops — a mix of jersey, t-shirts, sweatshirts and fleeces — one pair of pants, a pair of practice shorts and sometimes also a bag or belt. You need to buy a minimum of twelve packs, and if you just buy twelve the cost of each pack will be between two hundred dollars and $275, depending on what is included. If you buy ninety-six packs the price can get as low as $175 each. Because Victory is factory direct you need to log on their website to make a purchase. Besides pants, you can also buy individual jerseys (which are fully customizable) batting gloves, socks, stirrups, jackets and other baseball apparel.